Miguel Ángel Nadal Homar, Spanish football player in the 80’s and 90’s, was born in Manacor (Mallorca) on July 28, 1996. He played 18 consecutive seasons in the Spanish Football League, defending the shirt of two teams: Real Mallorca, in two periods, and FC Barcelona. Miguel Nadal made his debut for Mallorca on 19 April 1987 in a 1-0 defeat by FC Barcelona - the club he was later to join and with whom he won some of the highest honors in the game. Nadal played as midfielder and, during his last years, as central defender. Footballer of great strength and physical power, he distinguished himself for his defensive tasks, his powerful aerial game, and strong shooting that allowed him to score a good goal average. Even when Real Mallorca has been the club where he has played most seasons (ten, in two periods of four and six seasons), it was his playing time of eight seasons at FC Barcelona that he reached his professional peak, the biggest personal recognition, and an enviable list of titles. He was part of the Barça 'Dream Team' which lifted the European Champion Clubs\\\' Cup in 1992, the UEFA Cup Winners' Cup in 1997 and two UEFA Super Cups in 1992 and 1997. 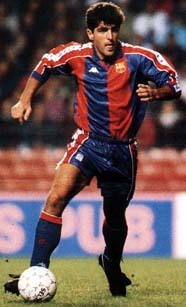 His domestic titles include five league championships, three Spanish Cups and four Spanish Super Cups. Nadal claimed his first international cap in November 1991, as Spain defeated Czechoslovakia 2-1 in Seville. It was the first of 62 appearances for his country, his final bow coming over a decade later at the 2002 FIFA World Cup. Nadal returned to his hometown club Mallorca in 1999 and has made 255 appearances for the islanders in Spain's top flight. At a press conference to announce Nadal’s retirement at the Son Moix stadium today, club chairman Mateu Alemany said: "This is a sad day for all Mallorca fans. It has been a great privilege to have known a player of his reputation, both on a professional and a human level. He retired as active player at the end of the 2004-2005 season. Since then he’s devoted to advise his nephew, the tennis player, Rafael Nadal, in different professional and sporting activities. Nadal played 462 league games and scored 33 goals. 4 League Titles: 1991-1992, 1992-1993, 1993-1994, 1998-1999. 1 UEFA Champions League Title: 1991-1992. 1 UEFA Cup Winner’s Cup: 1997. 1 European Super Cup: 1993. 2 Spanish Super Cups: 1992, 1994.